Licensed and bonded serving Richardson and surrounding areas. Whether you have new construction or an older home, we can accommodate your needs in simple terms to get you the most security for the money. We offer security monitoring to give you peace at mind while home or away. Certified for both fire and burglary alarming as well as 24/7 surveillance. Contact us today for a free quote and directory of our services. We know how much you value your loved ones, home and belongings, and this means you want only the best in alarm monitoring services available. At McKinney Security Solutions, we are truly committed to helping you protect what matters most to you. Our central monitoring station is U.L. Certified which means you can count on reliable home security monitoring 24 hours a day, seven days a week, 365 days a year. If ever a natural disaster were to occur, our central monitoring station is backed up out of state – ensuring superior monitoring, guaranteed. What do you want most from your local security company? Our full range of service offerings is individually designed to meet your most important needs. 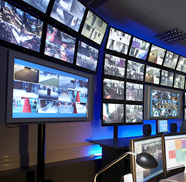 We offer alarms, monitoring, access control, and a full array of services to secure what is important to you. If you would break into your own home, how would you do it? Our conversation in customizing a solution for you will include onsite visits to allow our expertise build the right solution for you. Are you more concerned about protection when you are home in Richardson or away? We have trained profressionals to discuss with you your areas of concern for security.